Little Blog on the Prairie by Cathleen Davitt Bell has a cute cover, and a lot of the reviews focus on the "fun premise" and humor. The premise is engaging, and a lot of the humor works. It's not that embarrassing strained stuff that turns up in a lot of kids' books. But I think there's a little more going on here than just a funny fish-out-of-water story. Genevieve Welsh has been dragged against her will to a "frontier family history camp." Gen, along with her brother and both her parents are going to be living in the year 1890, along with three other families who have all paid to stay for the summer with a family of three who have turned their backs on the twentieth century and live in, what for them, is a better time. Hmmm. Or have they? The campers have to give up all twentieth century technology, as well as twentieth century clothing, food, plumbing, standards of hygiene...everything. Gen doesn't quite do without, because she manages to sneak in her brand new cell phone. The texts she sends to her friends end up on a blog one of them creates as part of her computer camp assignment. Yes, there's a lot about how hard it is to do without twentieth century comforts. What's interesting, though, is that there isn't a lot about how incredibly wonderful things were back in the good old days. Yeah, there's some fun times playing with other kids every now and then, and, sure, freshly baked bread smells good--if you can figure out how to make it. But a number of the campers...of the adult campers...are suffering big time trying to make the 1890's grade, just as they would have if they'd been living back then. And Ron, the guy who runs this place, is a bit of a sadist, playing people against one another, pressuring them to kill chickens to earn points, and insisting that campers plan an improvement for their individual "farms," which he just happens to own. I sensed a dark edge to this book, a dark edge I liked. 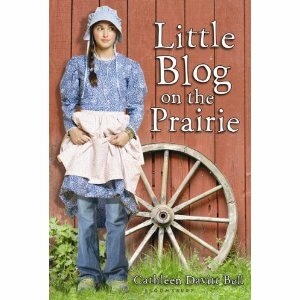 Davitt Bell seemed to me to be trying to maintain a balance between a traditional tween girl story with some mean girl conflict and a potential boyfriend and a deeper tale exposing young readers to something more thought provoking. Why should we do without the technology of the period we were born into? What, exactly, is wrong with refrigeration and showers? Why is the past when people worked themselves to the point of despair and didn't survive accidents (or sometimes even unpasteurized milk, something I couldn't help thinking about as I read this) such a great place? This might make a good kids' reading group book or a parent/child book club selection. It's out in paperback, and I'm thinking about getting it for my niece. Oh, and it's also an example of mainstream fiction--no paranormal or fantasy elements. "The past is a foreign country: they do things differently there." --The Go-Between.